Water resistance is a very confusing topic for many consumers. In fact, many consumers believe if their watch is marked water resistant, they can immerse it in water, which is not always the case, as there are many levels of water resistance. Water damage to the watch movement can be a very costly repair, and usually requires replacement of the movement, so it is very important to understand what your watch can handle. Some consumers also confuse the term Water Resistant with Water Proof, and in fact the FTC (Federal Trade Commission) has determined the term “Water Proof” is inappropriate for a water resistant watch since there are so many factors and conditions that can cause a watch to take in water. Understanding the water resistance rating is an important part of knowing what type of activities can be done while wearing your water resistant watch. See the Water Resistance Guide below. One of the most important precautions to follow is to have your water resistant watch tested every time the case back is removed. The most common reason a case back is removed is for a battery replacement. Be sure to use a certified watch maker with the proper training and equipment to perform both the battery replacement and the water resistance test. 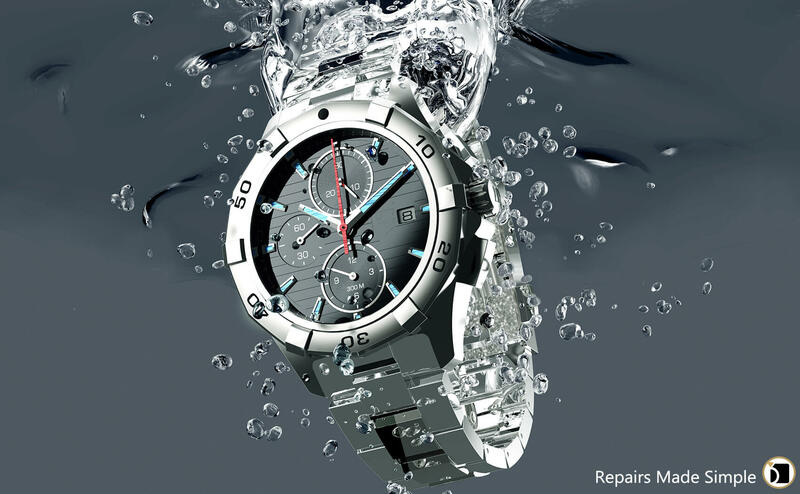 • Always take your watch to a certified watch maker at the first sign of water damage or moisture under the crystal. • Do not expose your watch to extreme temperature changes. • Do not wear your watch in a hot tub, sauna, or hot shower. • Do not expose your watch to corrosive chemicals or swimming pools with highly chlorinated water. • Never open, wind, or operate the crown while in water or press the buttons of a chronograph watch while in water unless deemed okay by the manufacturer.